Over the past 30 days, the World Cup has absolutely dominated the search engine trends beating powerhouses such as Justin Bieber and Twilight. Typically, Justin Bieber steals the show both in Google search and in Twitter trends. 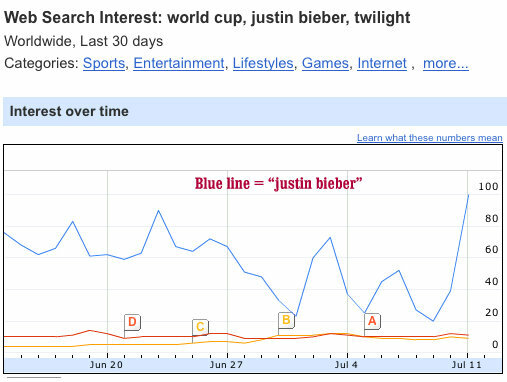 But over the last month, nothing – not even Justin Bieber – could come close to comparing to the searches for the World Cup. As you can see, the search phrase “justin bieber” has dominated the search engines over the past 30 days. This reflects the changing dynamics and popularity of football (or soccer) both here in the US and throughout the world. Beyond their general interest, searchers were also looking to buy hats, jerseys, flags, and other goods to show their support of their favorite teams, according to Google Retail.